We then had breakfast and made a plan to work together to get stuff accomplished, you know teamwork but the hawks had other ideas. First I had a pair of Cooper Hawks come in to take a look at my chickens, then a pair of Red Shoulder hawks, come on guys! 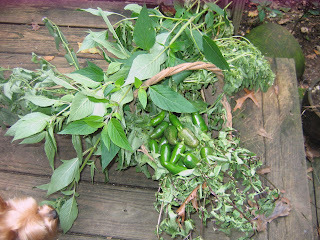 So I decided one of the things on my list was to get the rest of the harvest out of the gardens. I harvested many of my basil's that I grew in the greenhouse, Sweet, Cinnamon, Lemon, Lime Basil as well as this wonderful Pineapple Sage that "Zoe" our Yorkie is smelling in the picture. We were also blessed with an abundant crop of Jalapeno Peppers as well! New Fence and more room!